a mathematical model developed by researchers at the Massachusetts Institute of Technology, us, may have an answer to medical problems like osteoporosis, joint hyperextensibility and scurvy. The model explains the structure of collagen--the protein that forms human bones--muscles and other tissues from atomic to the tissue scale. It has earlier been validated that collagen consists of molecules staggered lengthwise, arranged like fibres in a steel cable. Each tiny tropocollagen molecule--the smallest collagen building block--is around 300 nanometres long and only 1.5 nanometres thick (a nanometre is one-billionth of a metre). The paper, published in the Proceedings of the National Academy of Sciences, explains why these ropy strands of amino acids--the molecular building blocks of proteins--associate to form tropocollagen molecules consistently at the same length. 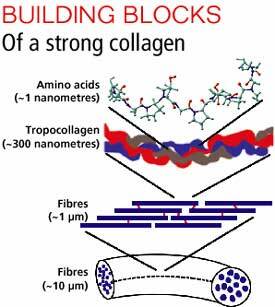 The paper says that the ideal length of tropocollagen molecules is indeed close to 300 nanometres and shows that the characteristic nanopatterned structure of collagen is responsible for its high extensibility and strength. "This is the first time a predictive, molecular model has been used to explain the design features that experiments have shown for decades without understanding the rationale behind them," said lead researcher Markus Buehler. He said that he had started the development of the model on the atomic scale. Combining elements of quantum mechanics and molecular dynamics to scale his model up he showed precisely which length and arrangement of molecules were best for sustaining large weights pulling in opposite directions. "The reference point for healthy collagen enables us to study how diseases or genetic mutations impact the structure," he said.